fire, put in some Anchovy, and stew them till their remains liquor enough for sauce, then put in a little white wine or clarrot which you please; If your liquor be too thin, put in a piece of dridg'd(?) butter to make it thicker, and a little of your Kitchup, and if (?) for a little vinegar, use some of your pickels and carry them in with that sauce. To make a Frigasee of Rabbits Let your Rabbits be young and nice(? 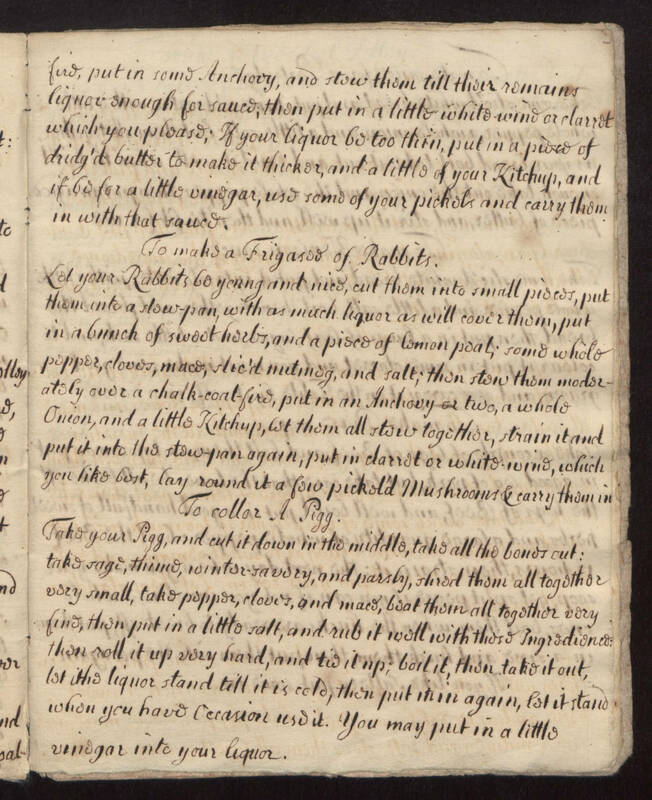 ), cut them into small pieces, put them into a slow-pan, with as much liquor as will cover them, put in a bunch of sweet herbs, and a piece of lemon peal; some whole pepper, cloves, mace, slic'd nutmeg, and salt; then stew them moderately over a chalk-coal0fire, put in an Anchovy or two, a whole Onion, and a little Kitchup, let them all stew together, strain it and put it into the stew-pan again, put in clarret or white-wine, which you like best, lay round it a few pickel'd Mushrooms & carry them in. To coller a Pigg. Take your Pigg, and cut it down in the middle, take all the bones out: take sage, thime, winter-savory(? ), and parsley, shred them all together very small, take pepper, cloves, and mace, beat them all together very fine, then put in a little salt, and rub it well with those Ingredienes(?) then roll it up very hard, and tie it up; boil it, then take it out, let the liquor stand till it is cold, then put it in again, let it stand when you have occasion use it. You may put in a little vinegar into your liquor.